Today authors Philippa Ballantine and Tee Morris are here discussing steampunk fashion. They write the very fun and action packed Ministry of Peculiar Occurrences series. Diabolical villains, gadgets, mysterious organizations, gadgets, secret agents, fans of steampunk (or any) adventure should find out more. 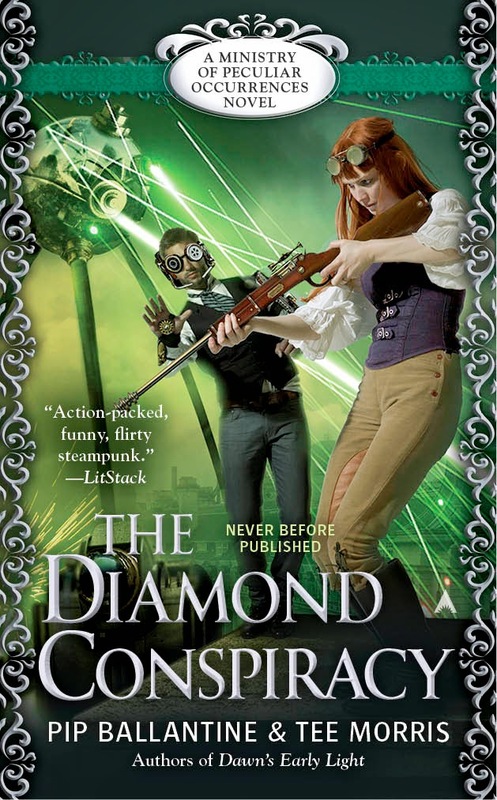 The latest book in the series, THE DIAMOND CONSPIRACY, is out March 31. Steampunk has an easy to spot look, and if you go to any genre convention, not even a specific steampunk one, you are bound to see it. In fact, you might spot us! 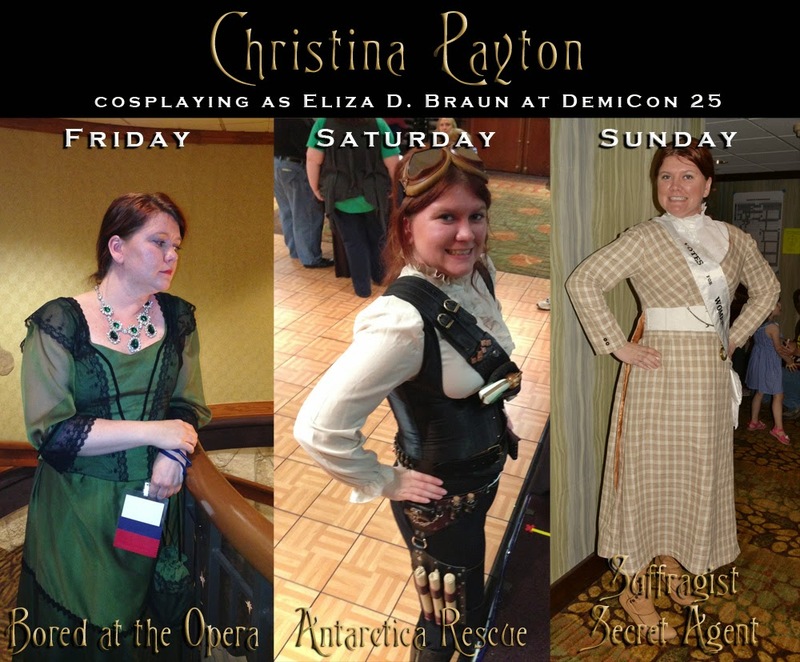 I write the steampunk series the Ministry of Peculiar Occurrences with my husband, Tee Morris, and both of us enjoy dressing up for conventions and appearances. In fact I may spend more money buying shiny and beautiful costume pieces in the dealer room than we make in books at the event. I like to think of it as being a steampunk fashion patron. For women, steampunk can be any number of things. Some prefer something closer to the historically accurate Victorian look, complete with bustles, petticoats and beautiful fabric. While some people might have the idea that sepia and plain tones were favored by the Victorians, they actually loved color! So you are likely to see crimsons, vivid purples, and all sorts of patterns on display at conventions. 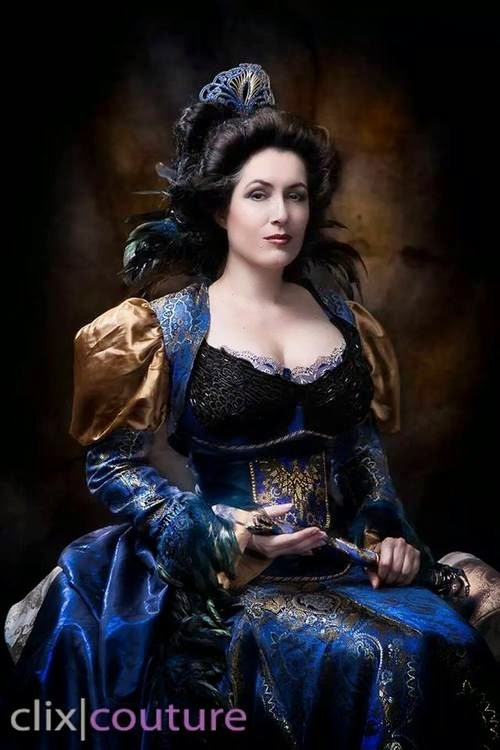 Costumer Aleta Pardalis shows this in her steampunk take on Rowena Ravenclaw. My personal favorite fashion item is hats. Little steampunk top hats pinned into the hair. Explosions of feathers and jewels like hats from Blonde Swan. And even cowboy steampunk crossovers, with vials full of who knows what mystical potions. The other staple of steampunk is one you can identify immediately; the corset. Now it should be stressed that not every costume requires a corset (I have a lovely dress from Ties That Bynde which is cinched in, but far less restricted that a corset) however, many women love the effect and even the feeling of wearing a corset. The lovely Sarah Hunter takes wearing a corset to a whole new level in one of Brute Forces creations. However, if there is one thing steampunks love, it is accessories; earrings, brooches, necklaces, gloves, rings, and anything that that gleams. One of my favorite jewellery makers is Brassy Steamington, and I particularly love her Sightmare dragon eye pendant. It never hurts of a lady to have an extra eye on her. But what about the gentlemen, surely they don't miss out? Not. At. All. I'll hand you over to my co-writer and husband Tee Morris, to talk about his take on gentlemen and fashion. If you wish it to be, steampunk can be a commentary of the real Victorian Era, certainly, or if you wish it to be a reflection of today’s modern problems told via 19th century allegory; but for my own writings—be it in the world of The Ministry of Peculiar Occurrences or elsewhere—I make the statement that we as a society should return to something we have lost: the gentleman’s fashion. In steampunk you’ve got your grease-smeared tinkers and soot-stained airship pirates, sure, but you also have the dapper English Gent, the likes of which not seen since the days of John Steed in The Avengers. Why only just recently in Kingsman: The Secret Service did Galahad educate Eggsy on the finer things, beginning with the code "Oxfords, not Brogues" which meant nothing to me but should have. Why? Because I looked it up. Others did to. Steampunk stands in the face of this lost art of gentleman’s fashion and pledges itself to righting this injustice. Men’s Wear is not all Abercrombie & Fitch, thank you very much; and the genre’s affection for walking sticks, bowlers, and fine-cut suits, is ushering a renaissance of style. The beautiful thing about living steampunk style is a freedom to relish in the fantastical and outlandish, to go against the grain, and yet remain true to refined tradition. When wearing a bowler, it only feels natural to tip your hat to a lady as you walk past. When wearing a stylish vest and pinned cravat, your posture immediately corrects itself as the fashion feels more comfortable when you walk with your back straight, your chin elevated just so, and that’s if you’re not wearing a corset yourself. Oh yes, men wear corsets, too, and corsetieres now cater to such discretions. With a properly cut suit, the right pocket watch, and the right hat, you make what can never be questioned as the right first impression. Add to this thought-out ensemble a touch of brass and Victorian flair, and you will also need to carry smelling salts (in a finely crafted silver pillbox, of course) on account of all the ladies swooning. And if you worry that concern over such details make you less of a man, I suggest you take in a private showing of The Great Train Robbery with Sean Connery and Donald Sutherland. His own character of Edward Pierce concerned himself just as much over his fashion as he did the details of his daring heist. In the end he not only got the Crimean gold, he also got Lesley Anne-Down. Something to keep in mind. Fashion matters, especially when undermining a grand plot against the Queen herself. If you’re going to save the Empire, do so with style. New Zealand author Philippa Ballantine is a fantasy writer and podcaster. Her multiple series--Books of the Order, the Shifted World, and the Ministry of Peculiar Occurrences (co-written with her husband Tee Morris)--span many speculative fiction genres. 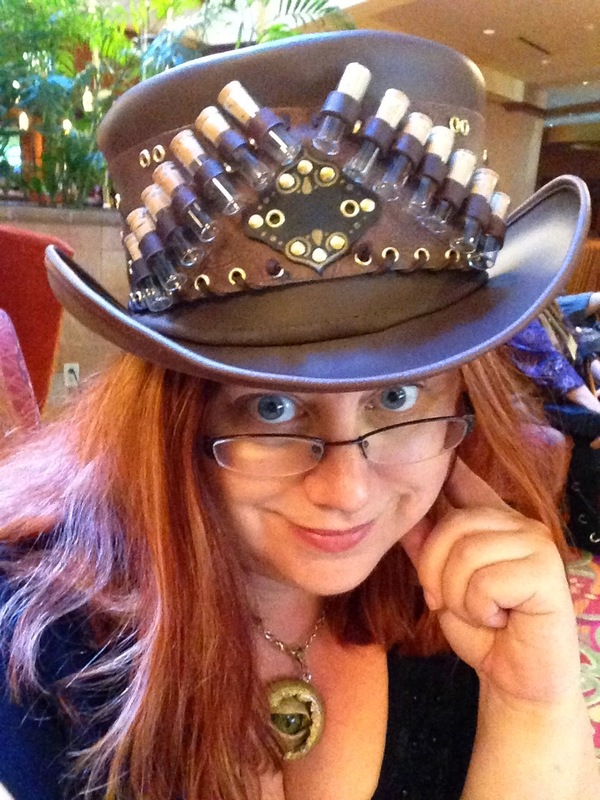 Her works have won an Airship, a Parsec, and a Sir Julius Vogel Award. They have also appeared in the Locus Bestseller list, and been in the Goodreads Top Science Fiction books of 2011. Most compositions of the author are the perfect versions. Great to enjoy it. these photos are so fun and cute. The most expert design bloggers do this, guaranteeing they are found by potential devotees. This will at that point lead you to find a rare sorts of people who additionally run form writes that you may appreciate.